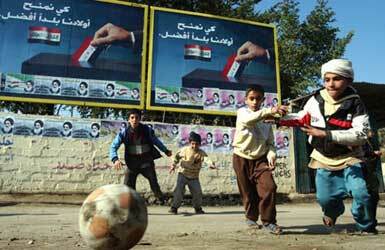 Photo of Iraqi children at play by way of the Situationist. Yesterday noon, an American squad from the United State Army (about ten to twelve) broke in Al-Mansour preparatory school for one reason or another. We don't have the right to ask them why they came to the school. The soldiers spread in different spots of the school walking towards the back yard which is used as a soccer field. Most of the students were in their classes when the squad came, but still there were many students in the yard who were terrified to see the American soldiers with their guns. One of the students was upset to see the soldiers and he threw a stone and hit one of them. Three soldiers surrounded him kicking him with their boots for some minutes on different parts of his body. Later, a teacher of English said that the captain of the squad told him "next time if students throw stones, we will use our machine guns not the boots". I really hated myself hearing that news as I am a teacher myself. What shall I do if I were there? ... What excuses will I give for that incident? My brain stops thinking from now on. Some U.S. commenters on the blog are indignant that the actions of U.S. soldiers should be presented in such a light -- others express sympathy with the rational, if misplaced, fear the soldiers must have been feeling. Last spring Washington Post reporter Sudarsan Raghavan investigated the question: what is this war doing to Iraq's children? ... Abdul Muhsin started to focus on children only last year. Like many of the estimated 60 psychiatrists who remain in Iraq, he treated only adults before the invasion. Back then, he said, children with psychological problems were a rarity. He and other child specialists say as many as 80 percent of traumatized children are never treated because of the stigma attached to such ailments. "Our society refuses to go to psychiatrists," said Abdul Sattar Sahib, a pediatrician at Sadr General Hospital in Sadr City. The Iraqi doctors fear that the violence the children have experienced will pervade Iraqi society for decades to come. 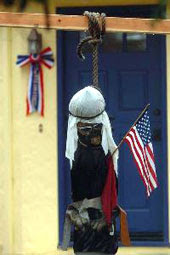 We know already that U.S. soldiers bring the mental agony of war home with them. 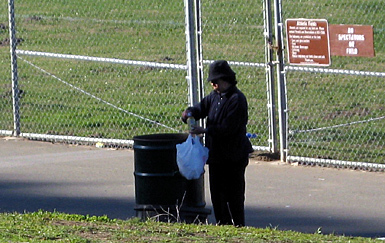 This woman was methodically circling the Polo Fields in Golden Gate Park today, checking each rubbish bin for recyclable bottles that can be exchanged for tiny amounts of cash. Was I seeing grinding poverty? Or was I seeing a person who makes a valued contribution to her family's welfare? Someone whose activity is a product of desperate need? Or a worker who pulls her weight to the best of her ability? 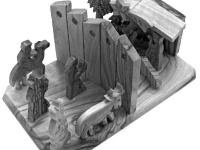 A nativity set with a difference - this year the wise men won't get to the stable. ...poignant, ironic and made in Bethlehem. 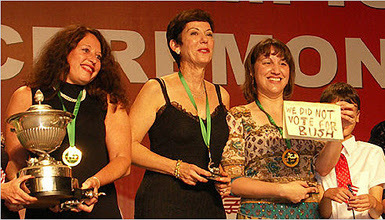 The Amos Trust is a U.K.-based organization that describes itself as working for "justice and hope for the forgotten." 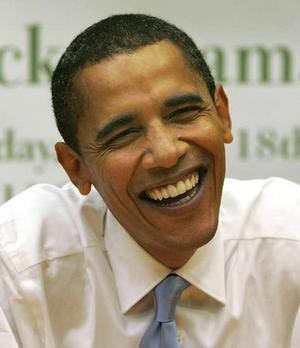 They can't attack him as unqualified to be President because he's black. That wouldn't fly in contemporary U.S. political discourse. So they make him deny he's a Muslim. 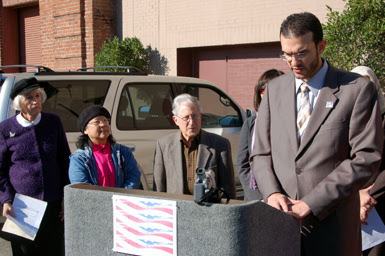 Members of the "Hate Hurts America" interfaith coalition held a press conference this morning outside Talk Radio KNEW 910. KNEW is the San Francisco home of hate radio host Michael Savage. 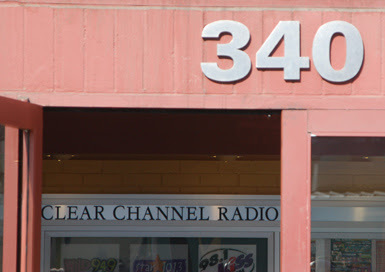 Not surprisingly KNEW is an outlet of Clear Channel, the megaconglomerate that claims 110 million listeners to its radio stations. "[W]hen I see [Muslim extremists] hanging from lampposts, with their guts hanging out, then I'll believe that there's a difference between radical Islam and the rest of Islam over there. But if I don't see that -- if I don't see the massive uprising against them, I can only assume that they're the shock troops of all of Islam in the Middle East." "What kind of religion is this? What kind of world are you living in when you let them in here with that throwback document in their hand, which is a book of hate. Don't tell me I need reeducation. They need deportation. I don't need reeducation. Deportation, not reeducation. ..."
That is, he's a jerk who peddles prejudice and fear for profit. Hate Hurts America points out to advertisers that they may not want to be complicit in the hate business. Some big companies, including Office Max, JC Penney and Autozone, have responded, dropping ads on Savage's program. Today's press conference organized by the Muslin civil rights organization CAIR, promoted an interfaith petition asking other advertisers to get out of hate mongering. Speakers included lots of San Francisco's activists, including representatives of the Lt. Watada Support Committee, the American Friends Service Committee and Gerardo Sandoval representing the city supervisors. 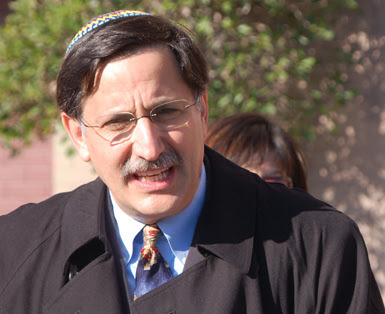 But by far the most interesting speaker was Rabbi Harry Manhoff of the San Francisco Board of Rabbis who took as his text the famous statement of the German pastor Martin Niemoller -- "They came for the Communists, and I didn't object - For I wasn't a Communist; ... They came for the Jews, and I didn't object - For I wasn't a Jew; Then they came for me - And there was no one left to object." He explained [my paraphrase] that he had begun to worry -- though he had preached against the Bush Administration's Iraq invasion and suspension of habeas corpus within his own congregation, he hadn't really stepped out into the public eye with his criticisms. He was afraid taking too strong a presence would be used to criticize "my beloved Israel." But the kind of venom encouraged by Savage had convinced him he must speak out and reach across expected chasms. Hate-filled words can and do lead to violent actions. 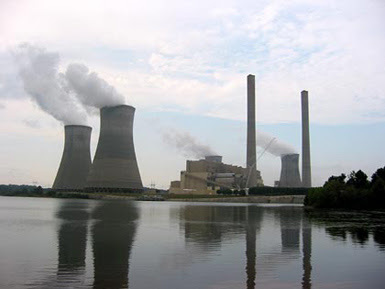 Georgia Power’s Plant Scherer, near Macon, is the largest single point source of carbon dioxide emissions in the United States. Photo by Jeff Goodell. Natural History Magazine. Do you suspect you ought to know more about how the United States contributes to the planet overheating? 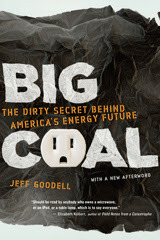 Reporter Jeff Goodell offers a heaping serving of understandable, if not palatable, explanation in Big Coal: The Dirty Secret Behind America's Energy Future. The author is a magazine feature writer and it shows. In the first sections of the book he puts a human face on the people who dig coal and who live with mining's byproducts, the people who transport the black rock, and the industry that profits from coal extraction and burning. But this book is about more than explicating the problem -- and yes, our addiction to the energy provided by coal is a big problem. Goodell wrestles with a fundamental question: can a global capitalist society decide that the common good must prevail over the very engines of its wealth: individual greed and short-term profits? We don't need to destroy our world, just reinvent it. He finds hope for reinvention in what to U.S. sensibilities is an unlikely place -- among polluted China's rural developers. In that society, where living standards are on the rise despite labor and ecological horrors, he finds a "can do" spirit which encourages hope. (This tracks with the polling reported here.) And he's a hopeful guy because of his own background; having grown up in Northern California during the energy crunch and "malaise" of the late 1970s, he saw the rise of Silicon Valley as proof that the new futures could be imagined just when progress seemed to be hitting a wall. We hear it all the time: if we pass laws that limit CO2 emissions, the price of electricity will skyrocket and the economy will collapse! If we clean up dirty coal plants, the price of electricity will skyrocket and the economy will collapse! ...This is nothing new in America. ... the writer Ian Frazier observed, "Lincoln's great moment was saying 'I don't care if it is destructive. Slavery is wrong. 'You start with, 'Is it right or wrong?' Then you act on that judgment. You don't say, 'I'm not going to say it's wrong because it would be too impractical to undo.'" Burning coal may not be the moral equivalent of slavery, but it is a moral question nevertheless. One could quibble about whether Lincoln really treated slavery as the unequivocal moral evil we now so easily declare it to be. But it is worth noting that to imagine a solution to the climate crisis we face, Goodell has to shift the terrain of the discussion to a moral realm that the economic system in which we live explicitly and intentionally excludes from our social and scientific understanding of the world. Readiness to pay a price in order to enforce an idea of what is right is part of what keeps sides [in the labor dispute] from settling.... in labor relations, the bottom line isn't always the bottom line. It takes a considerable mental shift to get that statement out of a conventional economist. Goodell is almost certainly right that "goods" that can't be entirely calculated within capitalist economics will have to be the end of measures to preserve a livable planet. Tinkering at the edges of current practices with "cap and trade" emissions control markets isn't going to cut it. Big Coal loses if the planet wins. Can we, like the emerging Chinese, even imagine that we could demand and enforce an end to current destructive energy addictions? Are we able to make the fight to get there? Fires of hell? No. A factory in India where New York City manhole covers are made on contract for Consolidated Edison. We don't usually get to see the labor on which our well-being rests. Kudos to J. Adam Huggins for this picture from today's New York Times. 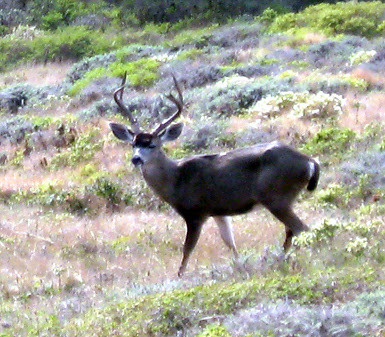 Yesterday I met with a prospective local candidate. He's a good guy and would be wonderful to have in government. I was encouraging and even donated to his campaign. And I said to him what I say to all of them: to win office, you have to run with all your being -- and you have to understand that the qualities that make a good candidate are completely different than the qualities that make for a good officeholder. I've previously described the quality candidates need as benign megalomania. Our two most recent presidents, both of whom I covered while they were governors seeking the White House. Bill Clinton and George W. Bush are wildly talented politicians. Both claimed two presidential victories, in all four cases arguably as underdogs. Both could skillfully serve as the chief strategist for a presidential campaign. But their success came not because they convinced the news media (and much of the public) that they would be the best president, but because they dominated the campaign narrative that portrayed them as the best candidate in a world-class political competition. In the end, both men were better presidential candidates than they were presidents. 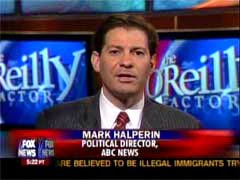 Halperin is criticizing the news media, his own profession, himself, for practicing the horserace journalism that values political dexterity over policy substance. He might as well criticize our capitalist culture that has assured most of us that candidates are just marketable commodities and that holds campaigns to no higher ethical standards than it holds prescription drug commercials. Warning: This film shows a performance artist undergoing, for real, interrogation techniques permitted in the CIA handbook. We did not sign up. We do not approve. We unsubscribe. Unite against terrorism. Unite against human rights abuses in the 'war on terror'. Go ahead; do it. It is not a lot, but it is something. But, glory, hallelujah. Now, that glory hallelujah is the fact that there is a humanity and a spirit that nobody can kill. And as long as you know that, you will resist. I'm pretty much video proof, but this is a frank, truthful, joyful conversation not to be missed. Video and transcript here. Take the time to watch; you won't regret it. The cancerously expanding Terrorist Security Center watch lists that underlie everyday U.S. airport security theater generate thousands of false stops and create inconvenience of hundreds of thousands of prospective passengers. But those experiences are innocuous compared with the harassment and humiliation that U.S. Muslims and others with Arabic names experience when crossing the border and boarding airplanes. "I was returning from a trip to Dubai and Saudi Arabia," recalls [Dr. Monzer] Kahf, [a well-known Syrian-born consultant, trainer and lecturer in Islamic banking, finance and economics] who has been living in the United States for 37 years and became a U.S. citizen in 1980. "The customs officer told me I had too many stamps in Arabic on my passport." Kahf said he was detained for an hour and a half, questioned and eventually let go. Kahf also added that since then he has traveled overseas 24 times and on each and every trip he was stopped, detained and interrogated. "Any time I leave the country, I'm usually stopped for at least an hour or two - the most was four hours," said [Shaikh Yassir Fazaga] an Eritrea-born soft-spoken imam. "I've gotten so used to it, that I actually prepare myself." 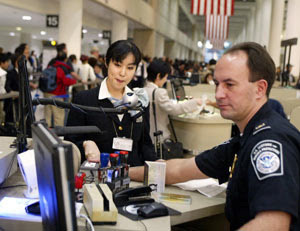 When returning to the United States from Canada in July 2006, Fazaga, who is a U.S. citizen, arrived two hours before his flight and was given clearance to board the plane only to be pulled off later. He was then detained and questioned for close to three hours. Fazaga was not given a reason for his detention but was cleared and let go. "I missed my flight and had to wait an extra day to catch the next flight out of Calgary," Fazaga added. On Dec. 16, 2004, Anaheim resident Bilal Dalati, 42, was coming back from a business trip with a 15-person delegation that included Congresswoman Loretta Sanchez and several elected officials. ... Then, something unexpected happened. "The minute I stepped off the plane, there were two officers waiting for me," Dalati said. "They took my passport, walked me to my luggage and then went through it piece by piece." Dalati, a U.S. citizen of 20 years, said he was pat-searched, had the contents of his pockets and wallet emptied and then asked odd questions. Dalati added that the officers subsequently photocopied all paperwork in his possession, and then he was let go. Given the frequency of these incidents, it is good news that the six Muslim religious leaders who were yanked off a US Airways flight last year will be getting their day in court. A federal judge on Tuesday rejected most defense arguments to dismiss a lawsuit filed by six Muslim imams who were arrested last November on a U.S. Airways jet in Minneapolis after passengers reported they were acting suspiciously. The imams have said that three of the men in their party said their evening prayers in the airport terminal before boarding the plane, then entered the aircraft individually, except for one member who is blind and needed a guide. Once on the plane, the men did not sit together. A passenger raised concerns about the imams through a note passed to a flight attendant. Also, witnesses reported that the imams made anti-American comments about the war in Iraq and that some asked for seat belt extensions even though a flight attendant thought they didn't need them. U.S. District Judge Ann Montgomery, in a 41-page opinion and order, said it is "dubious" that a reasonable person would conclude from those facts that the imams were about to interfere with the crew or aircraft. She said the plaintiffs had stated a plausible claim that Metropolitan Airports Commission officers violated their constitutional rights. 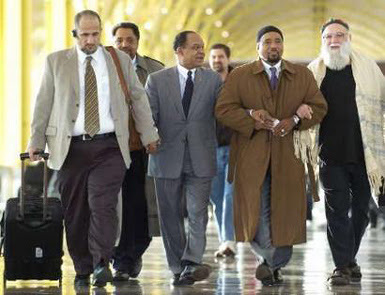 How very conventional these citizens, these imams, are! They think they should have a constitutional right to pray, travel and hold opinions. Perhaps courts will agree. We can hope so. Today the New York Times reports that air travel has gone smoothly for most Thanksgiving travelers. The weather was good -- and prospective airline customers are getting well trained: many began the holiday a day early to avoid the crush. 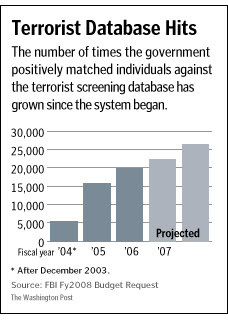 So how's our "no fly list," our security theater system, doing? According to slew of recent reports on the Transportation Security Administration (TSA) and its parent Terrorist Screening Center (TSC), the system is still limping -- and regularly infringes on our expectation that we're innocent until we commit a crime and should expect to be allowed due process to clear our names. Nor does it make us safer. Captain Robert Campbell was a pilot for the US Navy in Vietnam. He recently retired from a 22-year career as an airline pilot. "The fact is, I'm authorized by the TSA to fly the airplane and ride the jump seat on air carriers," he said. "But if I want to ride in the back, I'm on the No-Fly List." ..."It undermines the authority of the list," says Lisa Graves of the Center for National Security Studies. "There's just no rational, reasonable estimate that there's anywhere close to that many suspected terrorists." Inspector General Glenn A. Fine said its management by the Terrorist Screening Center (TSC) "continues to have significant weaknesses," producing a high error rate and a slow response to complaints from citizens. The review found that nearly half the initial name matches against the watch list proved worthless, suggesting that the government should consider misidentifications a priority and develop policies to address them, Fine said. First Amendment rights activist Edward Hasbrouck, working for The Identity Project, during the TSA meeting said that the "core of the proposed rule" is a requirement for "would-be air travelers to obtain permission from the government before they can travel." That, he said, infringes on freedoms of assembly of movement. And all this mass of names and data the government is collecting isn't just used to hassle people who want to fly. The government uses it in multiple other contexts. The State Department queries the list before issuing visas, customs and border agents use it to vet incoming travelers and a subset of the list is exported to airlines for their passenger rating systems. More than 800,000 local and state police can also query the database when they pull over a speeding car or run a detained person's name through their computer system. There was considerable discussion in today's [Congressional] hearings on whether the watch list should be checked for anyone trying to purchase a firearm. One can imagine the watch list, once thought of as merely a "No-Fly List," being used increasingly as a screening method to determine eligibility for a wide array of privileges and rights. A move in this direction would make it a true blacklist, with hundreds of thousands of Americans wrongly denied full participation in society because of erroneous placement on the list. This certainly seems possible if the powers-that-be feel the need for more coercive controls over some of their opponents. For the moment, most of us are not threatening enough to invoke such a response. And for the moment, we can and must still defend whatever political space we can make. But something cancerous and evil is growing among us, exemplified in those airport security checks. 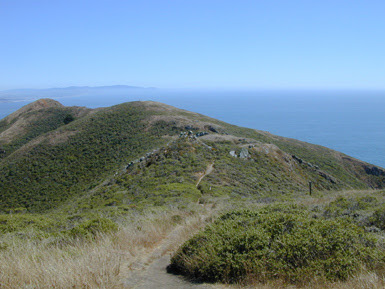 I don't celebrate often enough the wonderful land in which I live, the hilly trails where I run when my tired feet let me. 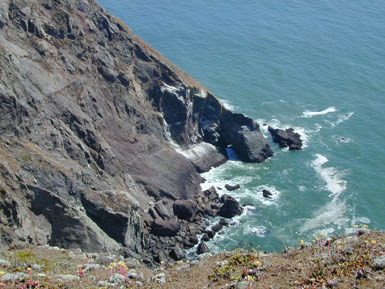 On the coast in the Marin Headlands (part of the Golden National Recreation Area) rocky coves hide where the mountains plunge into the sea. 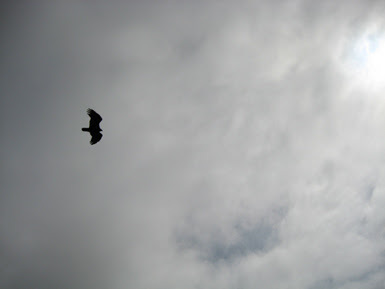 Hawks -- many turkey vultures actually, but there are redtails too -- soar on the thermals looking for dinner. 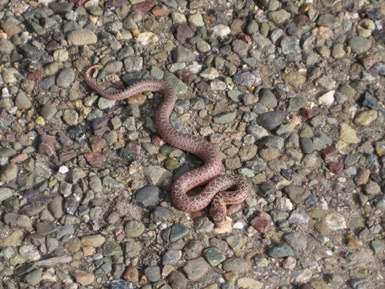 This guy tries to blend in with an old asphalt road and almost succeeds. 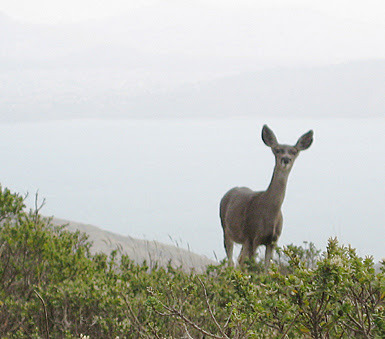 A doe checks out the slow moving intruder. While the gentleman of the family decides the runner can't possibly disturb their grazing. Here's yet another case of politicians picking their voters rather than voters picking their politicians. This one is from Florida. 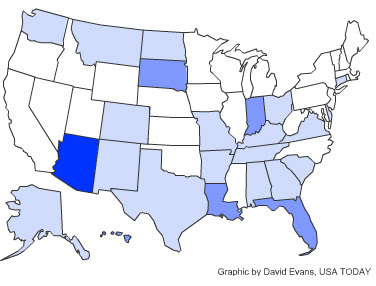 Like every state under the federal H[elp] A[merica]V[ote]A[ct] (passed after the 2000 election debacle), Florida has had to clean up its voter rolls and create a statewide database of registrants. More than 14,000 initially rejected — three-quarters of them minorities — didn't make it through that last set of [state] hoops. Blacks were 6 1/2 times more likely than whites to be rejected at that step. Hispanics were more than 7 times more likely to be failed. 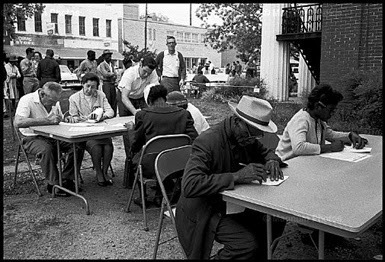 Unaccepted but also not denied, they remain in limbo as "incomplete" or, often, sitting in Florida's new statewide voter registration system with no designation at all. State law requires those "lost" voters to be notified; most contacted said they were unaware of the problem. If Republican authorities have their way, a lot of jurisdictions are going to need a new civil rights movement. In the early 90s I was part of a group of North Americans who shared their electoral experience with left parties in El Salvador. Our hosts shared a perfect description of this sort of barrier to public participation. They called it "strategic incompetence." Depressing thought for a Monday morning. 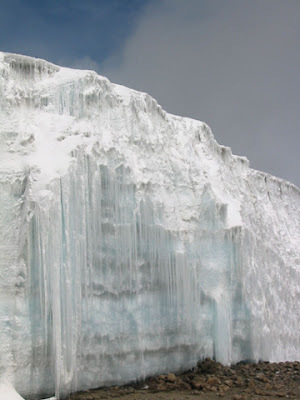 A corner of an evaporating glacier, Kilimanjaro, 2002. The message from the world's science community is that humanity has seven years in which to abate the growth of carbon emissions. That is less than a two-term President's opportunity to lead. The next American President effectively will decide mankind's future relationship with the planet. As of now, no Democratic candidate is making this necessary crusade the centerpiece of their campaign, and every Republican candidate in effect sub silentio supports the melting of the ice caps, drowning of Florida, flourishing of plague and pestilence, and sparking of global war over energy resources. In this latter respect if anything I underestimate the terrible policies advocated by the Republicans. They make the America Firsters of the years before Pearl Harbor look like globalists. The Democrats, however, have within their group no one who as yet is the fervent champion of what Al Gore has won the Peace Prize for. A San Francisco church that's been welcoming the LGBT community for more than three decades will celebrate its 150th anniversary this weekend. 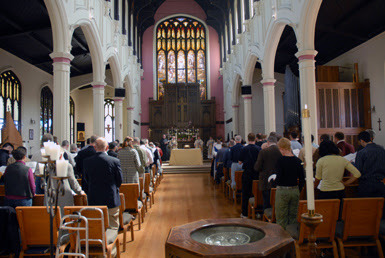 The Episcopal Church of St. John the Evangelist has survived low membership, the 1906 earthquake, an arson fire in the 1970s, and an ever-evolving neighborhood. The church, which occupies a quiet, leafy corner of the Mission District, will host a special Eucharist, reception, and dinner Sunday, November 18. You don't have to be Episcopalian to attend. The church offers a "very loving, supportive community," said Kathy Veit, one of the church's lay leaders. The church provides "something people are looking for that can be elusive in a place like the San Francisco Bay Area, where people are too busy to work on relationships," she said. Veit, who identifies as lesbian and was raised Roman Catholic, said before she became a member three years ago, it had been 25 years since she'd been to church. She said the Bay Area's transitory nature makes it hard for people to get to know each other, but church members do things for each other like taking meals to new parents, and helping elderly church members get to medical appointments. According to the Reverend John Kirkley, the church's openly gay rector – the pastor of the parish – as many as 80 percent of the church's approximately 90 members are LGBT. Veit said about 60 percent of the church's members live within walking distance, which is close to the Castro District, Noe Valley, and the South of Market neighborhoods. The party is this evening. I intend to enjoy. 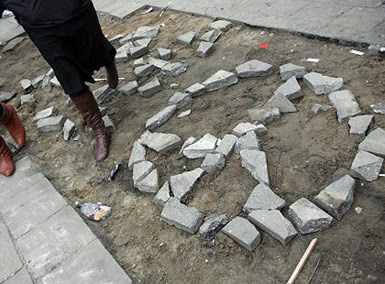 Chinese to show the way? 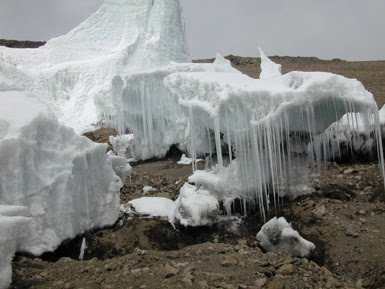 Glacier edge on Kilimanjaro in 2002; certainly long melted today. A survey of 1,150 youngsters found that one in four blamed politicians for the problems of climate change, while one in seven said their own parents were not doing enough to improve the environment. From the high asthma rates in Massachusetts to malaria scaling Mount Kenya, sick children have become the first victims of rising temperatures and extreme weather. International polling reveals that the adults also get it. Interestingly Chinese citizens are among the most willing to pay for needed costs and lifestyle changes. In all countries majorities agree that in order to address the problem of climate change it will be necessary for individuals in their country "to make changes in their life style and behavior in order to reduce the amount of climate changing gases they produce." ... China stands out as exceptionally willing to consider higher taxes as a means of combating climate change. When those against or uncertain about higher taxes are asked whether they would support them to increase efficiency or develop new sources, the total in favor of tax increases becomes a nearly unanimous 97 percent. Apparently there's something about living in a country on the economic rise that gives people at large a can-do attitude, something our current rulers in this country neither practice nor encourage. 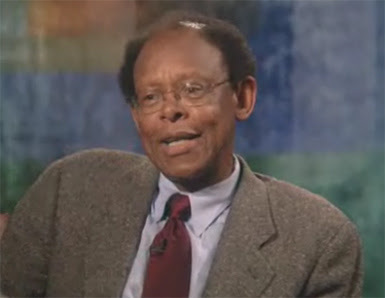 The question now facing us is whether global capitalism and Western democracy ... can make the limited economic adjustments necessary to keep global warming within bounds that will allow us to preserve our system in a recognizable form; or whether our system is so dependent on unlimited consumption that it is by its nature incapable of demanding even small sacrifices from its present elites and populations. If the latter proves the case, and the world suffers radically destructive climate change, then we must recognize that everything that the West now stands for will be rejected by future generations. The entire democratic capitalist system will be seen to have failed utterly as a model for humanity and as a custodian of essential human interests. Now there's a vision worthy of nightmares. Drops of water turn a mill, singly none, singly none. Buhdydharma has up a great post for this Iraq Moratorium Friday. The little essay explores the metaphor of the water of resistance -- the demand to stop U.S. war(s) -- spreading out through the U.S. population, seeping into unexpected cracks, leaking out where least expected. As an alternative to big peace marches and the tiresome, though necessary, work of pressuring complacent politicians of both parties, the Iraq Moratorium aims to get as many possible of us moving on a local level on the 3rd Friday of every month. The Iraq Moratorium project undoubtedly needs any spare change we have available. When you visit other people's countries, have you ever wished you could reassure your hosts that you aren't on board with contemporary US foreign adventures? Very possibly, if you are part of the 20 percent of U.S. residents who even have a passport. Apparently that's how the women pictured above felt. The sign scrawled on a menu reads, "we did not vote for Bush." They had just won an international bridge tournament in Shanghai; they were proud and happy; they wanted to share their moment with their international friends. “What we were trying to say, not to Americans but to our friends from other countries, was that we understand that they are questioning and critical of what our country is doing these days, and we want you to know that we, too, are critical,” Ms. Greenberg said, stressing that she was speaking for herself and not her six teammates. The controversy has gone global, with the French team offering support for its American counterparts. The U.S. Bridge Foundation was not amused. Sponsors, including the Chinese government, might withhold contributions. The offending sign makers are threatened with suspension from federation events, including the World Bridge Olympiad next year in Beijing. The federation demands an apology and more. The federation has proposed a settlement to Ms. Greenberg and the three other players, Jill Levin, Irina Levitina and Ms. Rosenberg, who have not made any mollifying statements. It calls for a one-year suspension from federation events, including the World Bridge Olympiad next year in Beijing; a one-year probation after that suspension; 200 hours of community service “that furthers the interests of organized bridge”; and an apology drafted by the federation’s lawyer. What's a bridge player to do when her federation wants to police her political views? What's an empire to do when women just want to be friendly? When you can't win an election on your own merits, wouldn't it be great to pick own your electorate who you can trust will vote for you? That's why politicians like to draw district boundaries to ensure one-party dominance. A new study [pdf] from the University of Washington's Institute for the Study of Ethnicity, Race and Sexuality shows pretty conclusively that by demanding voters show photo IDs, Republicans ensure that more voters are white, older, and affluent. Others, likely Democrats, get pushed off the rolls. Indiana's photo ID law is being challenged as discriminatory in court. Researchers set out to find what it really would do voter eligibility. They polled carefully randomized samples of voters and non-voters about their IDs. The results show clearly that the ID requirement is designed to build a Republican bias into the universe of voters and potential voters. 21.8 percent of black Indiana voters do not have access to a valid photo ID (compared to 15.8 percent of white Indiana voters -- a 6 point gap). When non-registered eligible voter responses are included -- the gap widens. 28.3 percent of eligible black voters in the State of Indiana to not have valid photo ID (compared to 16.8 percent of eligible voting age white Indiana residents - a gap of 11.5 percent). The study found what it termed "a curvilinear pattern (similar to an upside down U-curve)" in the relationship between age and access to valid ID -- younger voters and older voters were both less likely to have valid ID compared to voters in the middle categories. 22 percent of voters 18-34 did not have ID, nor did 19.4 percent over the age of 70. (compared to 16.2 percent of Indiana voters age 35-54 without valid ID and 14.1 percent for 55-69 year olds). 21 percent of Indiana registered voters with only a high school diploma did not have valid ID (compared to 11.5 percent of Indiana voters who have completed college -- a gap of 9.5 percent). Those with valid ID are much more likely to be Republicans than those who do not have valid ID. Among registered voters with proper ID, 41.6 percent are registered Republicans, 32.5 percent are Democrats. It's pretty clear who the authors of this law think should be allowed to elect their government officials. Maziar Bahari of Newsweek interviewed Sadegh Kharazi, Iran's former ambassador to France, about his country's tortured relations with the North American giant. ... whenever we wanted to have a rapprochement with the United States they demanded more. 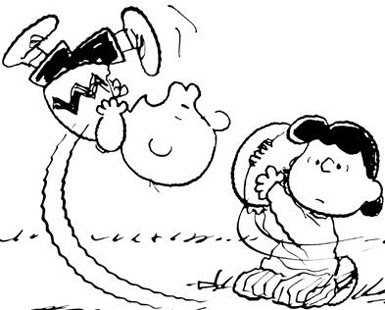 H/t to Informed Comment: Global Affairs. 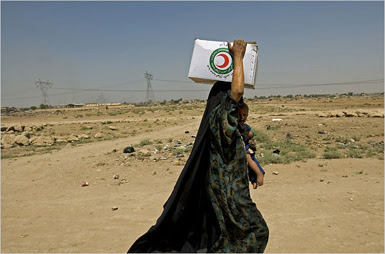 A woman with a supply of rations from the Iraqi Red Crescent Organization. Marko Georgiev for The New York Times. 1,500 Iraqis are being forced to leave Syria every day as a result of strict new visa requirements. Still, about 500 new Iraqi refugees are able to come into Syria every day, since they managed to get visas. There are an estimated 1.4 million Iraqi refugees in Syria. There is now a net reduction of 1,000 per day, so that if it continues, in about 4 or 5 years all the Iraqis will be out of Syria. Which is probably what the Syrian government intends. Note, however, that this influx of 7,000 Iraqis a week from Syria is not spurred by better security in Iraq (otherwise, why are 500 a day or 3500 a week still leaving Iraq for Damascus?) The exodus is being dictated by new Syrian strictness about visas and residency permits. Meanwhile, the UN Office for the Coordination of Humanitarian Affairs talked with people forced to return to a still desperately dangerous Baghdad. Broke and desperate, Ziad Qahtan Naeem and his family have returned to their house in war-battered Baghdad, a move they likened to a "death sentence". The six-member Shia family fled the Sunni-dominated Mansour neighbourhood of western Baghdad nearly two years ago and took refuge in Syria, joining more than one million Iraqis there. "At any moment you or any member of your family could be a statistic in a police file," added 46-year-old Naeem, who spent US$30,000 in Syria. Things have deteriorated to the point that some parts of Iraq are turning away Iraqis fleeing more violent parts of the country. Basra has begun keeping out arriving refugees. Dozens of families who arrived in the province on 9 and 10 November were forced to turn back or head to other southern provinces as Basra security stopped them at check points and prevented them from entering Basra city. “When they saw our bags, a police officer stopped us and told me and my seven family members that we had to head back to where we came from because the local council had prohibited the entrance of new arrivals,” Raghib Muhammad, a 43-year-old Baghdad resident seeking refuge in Basra, said. Relief agencies estimate that there are now roughly 2.5 million Iraqis forced into short term exile in Jordon or Syria by the violence unleashed by the U.S. war -- and an equal or greater number displaced within Iraq. If you click on the picture of Faiza on the sidebar to the right, you'll reach the Collateral Repair Project, an Iraqi grassroots initiative through which people in the United States can help some of the displaced in Jordan and within Iraq help themselves. Take a look. One Woman's Army: The Commanding General of Abu Ghraib Tells Her Story by General Janis Karpinski with Steven Strasser. A friend pulled this title out of a remainder bin, skimmed it, and passed it on: "You should read this." She was right. As the title makes clear, this is Karpinski's side of the story of the torture scandal, for which she was the highest ranking officer to be rebuked. As far as her apologia is concerned, on some subjects, like the complete muddle Donald Rumsfeld's Department of Defense had made of Army Reserve, she is very persuasive. At the mobilization station you end up with battalion commanders who don't know their brigade commanders, company commanders who don't know their battalion commanders, and soldiers who don't know each other or their leaders at any level. A soldier who grew up in Montana finds herself deploying with a bunch of guys from Brooklyn. A soldier who speaks no Spanish finds himself assigned to a company from Puerto Rico. If the system looks chaotic, it is. ... Most of the Reserve and National Guard units we sent to the Middle East starting in late 2002 had nothing like [the desirable] level of cohesion. For the rest of my days I will believe that, at Abu Ghraib , these soldiers were following orders when they humiliated and abused detainees. But this material is not what I found so interesting about this book. What drew me in, as a Vietnam-era feminist whose life experience made the attractions of the military opaque, is Karpinski's tale of what attracted her to the Army and how she persevered despite discouragement and actual abuse from its male hierarchy. [By 1977 when] the Army restructured itself into a volunteer force after Vietnam, it was attracting plenty of male recruits who wanted education and training that would carry over into civilian life. But the Army also needed warriors, and there were not so many volunteers for that assignment. That's where the women came in. Our policymakers' plan over the next decade was to steadily expand the ranks of women holding jobs in combat support and combat-service support. As more women were given roles as truck drivers, supply officers, intelligence analysts, and the like, more men would find those jobs closed and be forced to join the warriors. And once you became a professional infantryman, you were much more likely to make the Army your career. There were lots of civilian jobs for truck drivers and electronics technicians trained by the Army -- but not so many for combat fighters. 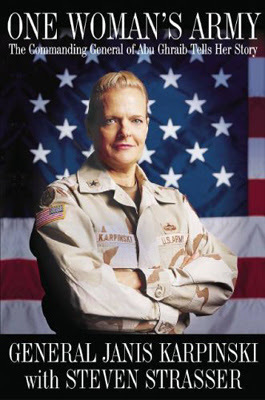 Karpinski didn't understand how women soldiers were being used to track men into less desirable jobs when she enlisted -- nor does it seem that she would have objected if she had known it. This is a woman who consistently identifies with management, a useful state of mind in a rigid hierarchy. But she's also no dope. Her struggle with her status as a woman in a man's world is interesting. I was determined to become a soldier's soldier ...But I had to acknowledge something else about myself: I also wanted to remain a woman. ...Some women -- even straight women -- tried to neutralize the men by joining them, cutting their hair and playing down their female characteristics. For my part, I tried to be both an office and a gentlewoman. ... The way to be taken seriously in a man's world is force them to engage your intelligence, not to try to change what you are. Well maybe. It worked for a long time for Karpinski. She aced paratrooper training. She fought off superior officers with wandering hands. She worked for male officers who respected her -- and male officers who were terribly threatened by her competence. She rose up the ranks -- and ended up learning Arabic and training women in the United Arab Emirates for military service. She was eventually promoted to brigadier general of MPs in the Reserves. you have to look up the chain of command as well as down. The book is a fascinating cultural period piece and an angle on the war worth more attention from those of us trying to end it. Where would we be without an enemy? Certainly not willing to throw away our wealth, creative energy, and historic appreciation of the rule of law for a mess of "homeland security" and military boondoggles. Interestingly, people in the United States have proved somewhat resistant to taking up a crusade against the people of one of the world's largest religions. We require manipulation. Pollsters and communications advisers to congressional Republicans are urging lawmakers not to follow President Bush's lead when it comes to talking about terrorists and the threat they pose to the nation. While Bush has lightened up on using the word "Islamic" in front of terrorists, the advisers said on background that the word should always be used because Americans believe that "Islamics" are those who act on terrorist threats. Words to avoid are "Muslim," "extremist," and "radicals." One adviser, who was part of two closed-door briefings by the consultants to GOP congressional members and aides over the past two weeks, said most Americans polled are not threatened by "Muslims" and that the words "extremist" and "radical" conjure up an image of people who make threats but don't follow through with them. "People believe terrorists act, so we should be using that instead of extremist or radicals. Calling the threat 'an Islamic terrorist' or 'al Qaeda' works better than 'Muslim radical,' " said the consultant. Looks like this effort is making headway in some pretty scary places. Jamil Dakwar of the ACLU has been observing the recent proceedings in Guantanamo at which one of the administration's newfangled "military commissions" found that Omar Ahmed Khadr is indeed an "unlawful military combatant." Despite numerous obstacles thrown up by the government, defense lawyers did have a chance to question the military judge, Army Col. Peter Brownback, about his impartiality. Col. Brownback also gave an unusual answer when he was asked what he knows about al-Qaeda. He said: "al-Qaeda is an organization or a group dedicated to the spread of Islam." Sure sounds like Col. Brownback has been slugging the koolaid -- apparently al-Qaeda = Islam; Islam = terrorism. I sure wouldn't want someone so confused and credulous as my judge. But our rulers think a guy this ignorant is highly qualified. The dogs were out for a ride on Valencia Street the other day. I have no idea why. 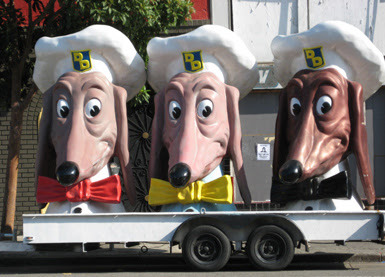 These three 7 foot high dog heads are relics of the Doggie Diner fast food restaurants that thrived back when we hadn't yet figured out that our car culture and cheap fatty meals were sure to kill us. The local chain was founded in 1949. One of these dog heads on a pole looked out from each location. When the chain failed in the 1980s, most of the heads were either destroyed or snapped up by collectors -- these must be some of those. After dedicated struggle by preservationists, the last dog head was planted out by Ocean Beach on the median strip of Sloat Blvd. at 45th Avenue. I imagine that tourists take it for something to do with the Zoo across the street. If those tourists care to look closely, they'll find this plaque at the base of the dog's pole. 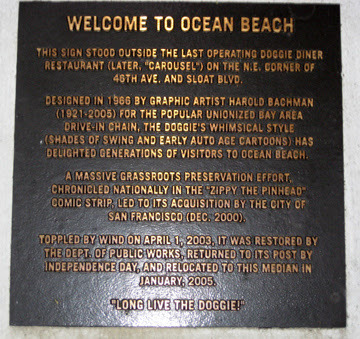 From the plaque, I learned the Doggie Diners were union shops. All the more reason to mourn that innocent era. 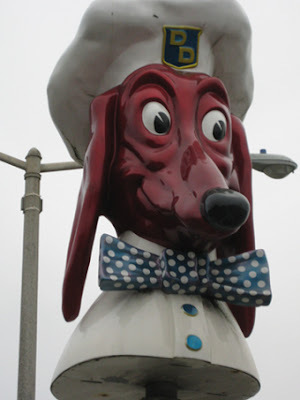 I've always liked the dog heads so I'm glad that Ocean Beach neighbors managed to preserve this monument to another time. Happy Birthday St. John's: We're 150 today! Terrors of the night Chinese to show the way? What did we know? When did we know it?